priced as a single channel system. Add $20,000 for a second channel. 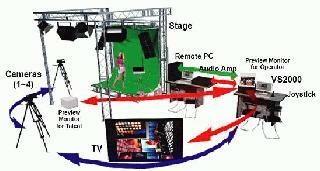 VS4000 Hi-Definition Real Time Virtual Set System. The VS4000 was designed to meet the demands of broadcasters as they migrate to exclusively HD equipment. The VS4000 combines the simplicity of Virtual Camera Technology, allowing users to create big studio effects in a small stage area, with high-end HD video and graphics in a low-cost, turnkey package. Come by our Event in California on March 27th,2007 to experience this state of the art Virtual system working with up to 2 HD cameras, in 1080i or 720p. Darim's VS4000 is today's most powerful turnkey solution for rapidly creating stunning live HD Broadcasts with 3D virtual sets. The VS4000 provides the keying of live actors or video feeds combined with full 3D to produce live studio broadcasts at a fraction of the cost. The VS4000 is a fully Integrated Real Time 3D Virtual Set Solution.The system comes with a Multi-input selector, Chroma Keyer, Camera tracking Processor, Real Time 3D Render Engine, 2D and 3D Video Mixers, Audio I/O with Delay Unit and a very convenient and easy to use software.You can easily take advantage of combining Classic and Trackless Virtual Sets.As we all know, Trackless cameras allow for a simpler expansion of the studio and have a wider aspect of 3D angle/position and zoom.The system has an excellent chroma keying for all types for background and lighting.The VS4000 is also equipped with a multi-media enabled real Time 3D render engine.We also added a new professional 3D virtual set control software.This feature makes everything a breeze to use.Another excellent feature of this product is the free-hand animation of virtual cameras and other 3D objects with a joystick.Also, you can easily customize virtual sets with out the need for a 3D authoring software but you can create and modify virtual sets using industry-leading 3D design tools which add to the flexibility of this product. Turnkey Solution for Producing Broadcasts. Unparalleled usability, running in minutes, operational in hours. Superior quality from integrated keying and optimized video feeds. Unmatched range of area movement for actors. Joystick - 5 axis control of camera moves. Complete on screen access and control of scene obects. Interactivity between Actors and Sets Animation and one button activation of programmed actions. Trackless camera movement allows for dynamic instant direction changes. Single User Operation for broadcasts. Priced for budget sensitive productions. Design sets with 3D Studio Max. VS4000 renders 3D worlds created with leading industry tools. Being a truly 3D virtual set, the VS4000 is not limited to simple background and foreground 2D images around the live video of an actor. Instead, it operates with 3D mesh objects, materials, virtual lights, cameras and animation tracks created with popular 3D graphics design software such as 3D Studio Max with support for Maya and SoftImage coming in the near future. The preloaded 3D graphics data gets converted into the full HD resolution, in real time by one of the most powerful 3D rendering engines. VS4000 processes live or pre-recorded video in 3D scene as a texture. When it comes to mixing video with the 3D graphics, VS4000 stands well above the competition once again by offering the virtual set designer and program producer an unbelievable wealth of possibilities. The VS4000 line can operate with up to 2 separate live video feeds or 1 live and 1 pre-recorded (AVI) video feeds both at full-D1 or reduced resolution with or without transparency Alpha- channel. Any of these video feeds can be used as special kind of material (texture) for any of the 3D objects in the scene. The target object may have any shape and furthermore may be animated, deformed, morphed, highlighted with a virtual light and a lot more. The VS4000 hardware will reflect all applicable changes to video image in real time. VS4000 is fully interactive and extremely easy to use. The video production process with VS4000 is fully interactive and controllable by a single operator who does not need to be an experienced video engineer. The operator may simply execute the predefined program script or alter the standard program flow in a variety of ways. For example, the operator may introduce alternative program tracks or decide to manually control any object of the 3D scene including virtual cameras in any fashion using keyboard mouse or joystick. More details and specs will be supplied upon request.